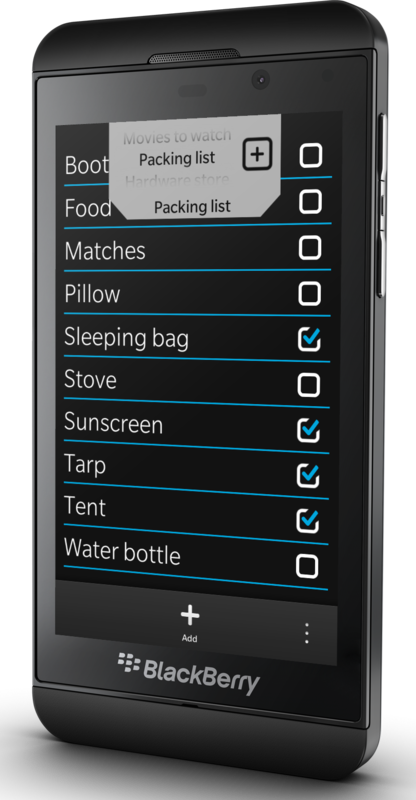 The Stuff I Need app gets support for multiple lists in version 2.0 of the app which in now available for download through BlackBerry World. The app also includes other improvements such as the use of more explicit keyboard shortcuts, but the ability to have multiple lists is the biggest change. Lists can be switched by pulling down on the tab at the top of the screen. This will expose a spinner that shows all of your current lists. New lists can be added by using the “+” button on the right side of the tab. Long pressing on the list name, will allow you to rename a list. Any lists with zero items will be automatically deleted once you exit the app. By default you are limited to just two lists, but you can get unlimited lists with a $1.99 in-app purchase.